This is shaping up to be a very exciting season for the Stockton Heat. The team is now in first place in the Pacific Division. If you’re still looking for gift ideas, consider purchasing tickets through this special promotion for family, friends, or colleagues. You can pick your exact seat and have your tickets delivered to you electronically. Please use the link below and enter the code SJCSMA when requested. 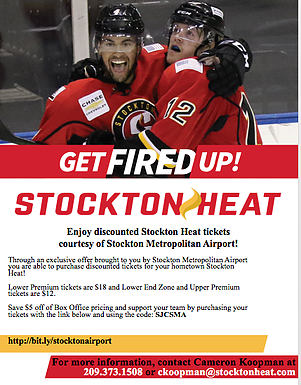 Stockton Metropolitan Airport is pleased to be a Stockton Heat sponsor.